Added by Deborah Baber-Savalla on June 7, 2018. When people and jobs leave a region, the result is a ghost town, a rust-belt area, or both. Examples of cities where people have left are Detroit, Akron, and Pittsburgh. And here may be a surprise: California has ghost towns. There is Belleville in San Bernardino County, Branson City in San Diego County, and Hoboken in Sacramento County. Why do people and jobs leave? The usual reasons are un-competitive industry, high-priced labor, government over-regulation, loss of demand for a region’s products or services, or a failure to attract new business. In general, Republicans blame bad economic conditions on excessive taxation and too much government regulation. Democrats, in general, like to use government power to try to create good economic times. Look at what is happening in California, especially in regions near the Pacific Coast. Housing is overpriced, schools are overcrowded, freeways are jammed, and parking is hard to find. A decent home in coastal California can cost between $1 million and $2 million (or more). In some cases, home buyers earning $300,000 a year cannot qualify for a home loan. In the California State Legislature, politicians have introduced bills to regulate land use. The State of California has, for just about every local community, established what is called a Regional Housing Needs Allocation (RHNA). RHNA rules tell a given city that it has to construct extra housing – in some cases hundreds of extra housing units must be built in a given city. Some of the housing has to be set aside for low-income people. The RHNA plan can also result in the building of high-rise, high-density housing (often called stack-and-pack housing). Republicans tend to argue that free-market economics, including lower taxes, will solve California’s economic problems. Democrats say that more government action is needed to bring about change. Could both political parties be partly right or partly wrong? To improve the quality of life, California might want to try a synthesis of basic Republican and basic Democratic philosophies. The goal should be to reduce California’s population. If California, which now has about 40 million people, could, by economic incentives, get rid of 10 million to 20 million people, then there would be no need for state mandates to build more homes and more transit projects. To reduce California’s population, use of free-market capitalism should help. When housing and other aspects of the cost of living (like taxes) become too high, people and businesses will depart because of their own free will. Republicans should be happy with this approach. What should the Democrats do? With their love of government intervention in the economy, Democrats should demand higher taxes. Democrats could increase California’s sales tax, income tax, and gasoline tax. Democrats could also impose some new taxes, such as higher taxes on businesses. The state’s corporate income tax, already the seventh highest in the nation, could be made much higher. Democrats could also impose a per-employee tax – often called a head tax – on businesses. Seattle recently imposed a $275 a year head tax on large businesses. Under this head tax, the employer would have to pay local government $275 a year for each employee. Small firms in Seattle are exempt. Certain cities in California, especially in the Silicon Valley area (south of San Francisco), are contemplating head taxes. Another action the Democrats could take would be to impose a special tax on the buyer of real estate. Suppose the buyer of a new home had to pay the state $50,000 when purchasing shelter. Already, something like a real-estate buyer’s tax has been ordered. On May 9, 2018, the State of California mandated that any home built after 2020 would have to have solar panels on the roof, adding $10,000 to $20,000 to the cost of a new home. Perhaps the time has come for a synthesis of Republican and Democratic ideas. The Republicans could let the free market work, and the Democrats could use government-induced incentives to push jobs and individuals out of California. With many fewer people, California could have affordable real estate, unclogged freeways, and places to park. No tax dollars would have to be spent on new housing projects and new transit projects. And Jerry Brown might get his wish. With a synthesis of Republican and Democratic ideas, California could become smaller and more beautiful. 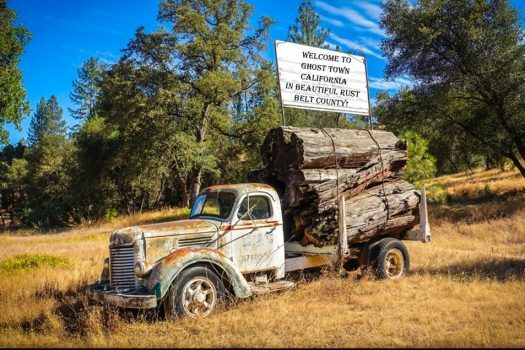 In effect, California could become like a rust-belt state. And there might be even be some new ghost towns.